In 2017, actor Kyle MacLachlan suddenly became a hot commodity again thanks to the return of Twin Peaks, so it made sense that Warner Bros. would dust off 1987's The Hidden and give it a Blu-ray issuance, even if only as part of their "Archive Collection" line (which are MOD, or "manufactured on demand", meaning they might be hard to track down at your local brick and mortar store, so ordering online is probably the route to go here). 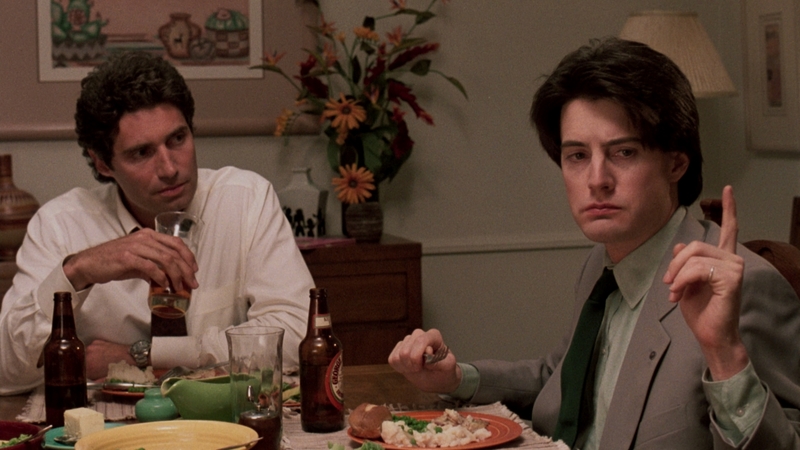 This movie takes on a bit of an extra Twin Peaks connection due to the fact that MacLachlan was quoted this year as saying that he based much of his Twin Peaks' "Dougie" character on the character he played in The Hidden. At first glance, the film is typical 80's sci-fi/horror fare. It starts off with a bank robber (played by Twin Peaks alum Chris Mulkey) racing away from the scene of the crime in a black Ferrari with the police in pursuit. After crashing into half of Los Angeles and pretty much totaling the car, the police finally gun him down. End of story, right? Not so fast! As the robber is recovering in intensive care in the hospital, we see a creepy black parasite exit his body and enter the body of another patient. It turns out that this alien uses humans as its host, and once it has no more use for one body, it moves onto the next - making it not only very dangerous but also very hard for the police to track down (at this point, of course, they don't even have any idea what they're dealing with). The main cop on the case is Tom Beck (Michael Nouri) who is less than thrilled when he learns that the FBI has been called in, and he'll now have to partner with agent Lloyd Gallagher (Kyle MacLachlan). But Lloyd is also more than meets the eye - he's an alien too, but a good one...out for revenge on the other alien, who killed his family back on his home planet. Of course, as is the case with many movies of this type, convincing Beck of the truth isn't the easiest thing in the world. 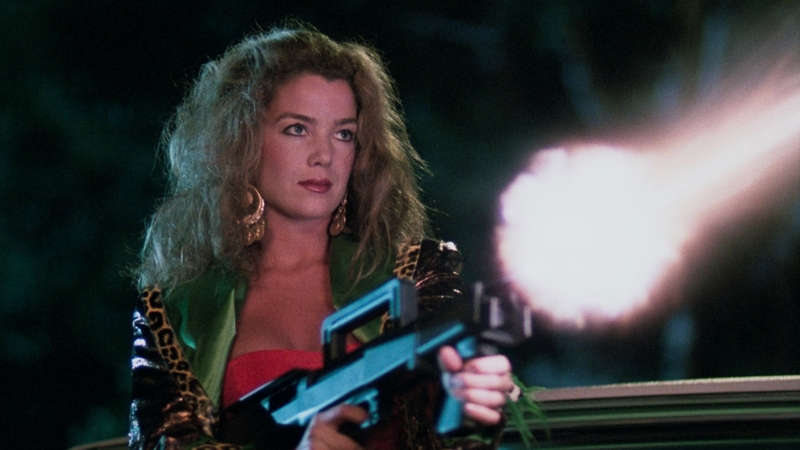 The evil parasite goes from body to body - even inhabiting 80's babe Claudia Christian at one point, if for no other purpose than to add a little eye candy for the viewers. The alien's real goal, however, is to get inside the body of a Senator (John McCann) about to launch an run for the White House. What makes The Hidden stand out - and one of the reasons it's become a cult classic - is largely due to its inventive and moving ending, which I won't reveal here, but which is no doubt why the movie still holds a fond place in many movie fans' hearts 30 years later. This is a fun, fast-paced film that is worth a spot in any sci-fi/horror fan's collection. The Hidden appears on Blu-ray as part of Warner Bros. Archive Collection line. The 50GB disc is housed inside a standard Elite keepcase, with no inserts. There are no front-loaded trailers on the Blu-ray, whose main menu is a still similar to the box cover design, with menu selections across the bottom of the screen. The Blu-ray in this release is region-free. The Hidden was shot on 35mm film and was originally released in the 1.85:1 aspect ratio. That's not the case here, as Warners has gone with "full frame" 1.78:1, meaning we're missing some (albeit not a whole lot) information on the screen. Another interesting tidbit about this release is how green it looks. 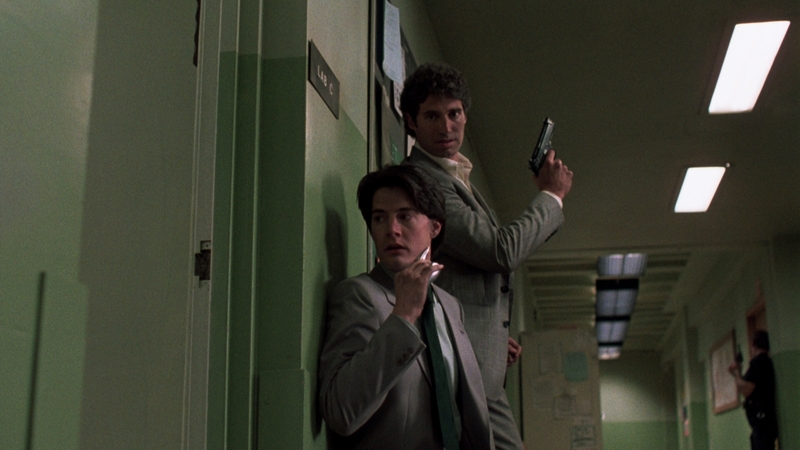 According to the director (on this release's commentary track), the movie has always skewed toward green, with Kyle MacLachlan's character wearing a green tie and light green shirt, the walls of the police station being painted a light green, etc. However, this new Blu-ray is far greener than any prior home video release of the movie - to the point where it's rather distracting. Does that mean the title is a closer reflection of the theatrical version (which I actually saw, but naturally can't remember exactly how it looked), or is this a bit of overkill. It's hard to say for sure, but I wish they would have dialed it back just a bit. As for the detail of the image itself, it's pretty good, although grain isn't as evident as I thought it would be - which could be a sign of a little too much DNR use. I don't see much in terms of over-sharpening in the transfer, but facial features don't exactly show a lot of detail to them, so there's some possible smoothing that might be taking place. Black levels here are decent and about what you'd expect for a movie of this age - nothing inky deep, but viewers should have no problem distinguishing things, either. I detected no blatant problems with banding, aliasing, or other frequently seen glitches. There are two audio options for this film. One is a new English 5.1 DTS-HD Master Audio track, while the other is an English 2.0 Mono track. The movie was originally released with a mono track, so that option is obviously here to allow viewers to have a home theater experience that closely matches the original theatrical presentation. The lossless 5.1 track, on the other hand, is here to make this movie more appealing to modern audiences, and they do a decent - if not spectacular - job with the mix. While a lot of the 5.1 mix is just spreading the sound across speakers, there's enough gunplay and explosions here to make the upgrade worth it. Dialogue is clear, intelligible, and exclusively front and center. Subtitles are available in English SDH only. Audio Commentary - The director of The Hidden, Jack Sholder, joins fellow director Tim Hunter for a quite enjoyable commentary track, offering a lot of behind-the-scenes details and stories. Before you ask "What does Tim Hunter have to do with this movie? ", rest assure that the answer is absolutely nothing. However, Hunter is quite familiar with star Kyle MacLachlan, having directed him in a number of episodes of Twin Peaks. Hunter is basically the moderator here, throwing questions at Sholder and allowing him to do the majority of the talking. Special Effects Production Footage (SD 7:32) - Director Jack Sholder narrates this look at some of the raw footage of the effects used in the movie. The footage here is a mix of both black and white and color and is shown in standard definition. Theatrical Trailer (HD 2:20) - The original theatrical trailer for The Hidden. A fun little action/science-fiction/horror film from the late 80s, The Hidden stands above similar movies by providing several strong lead characterizations and having a touching ending that is rare for a film in its genre. Recommended.